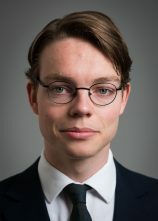 Gideon de Jong (1995) is in his Masters’ Programme in Public Administration after obtaining a Bachelor degree in Political Science. Organisation and policy processes on both a large and small scale have always appealed to him. This partiality showed itself also in multiple board years. This also provided him with an opportunity to further develop his secretarial instincts for administration and organisation. Aside from this, he is very keen on the Classics and philosophy, to which he gives time in his studies in Greek and Latin Language and Culture, and in leisure. At Schinkelshoek &Verhoog, he assists the general functioning of the office, and keeps an eye on developments in the media and the body politic of the Hague as a part-time employee.